If the last month has been about anything, it’s been about stillness by way of statuary. 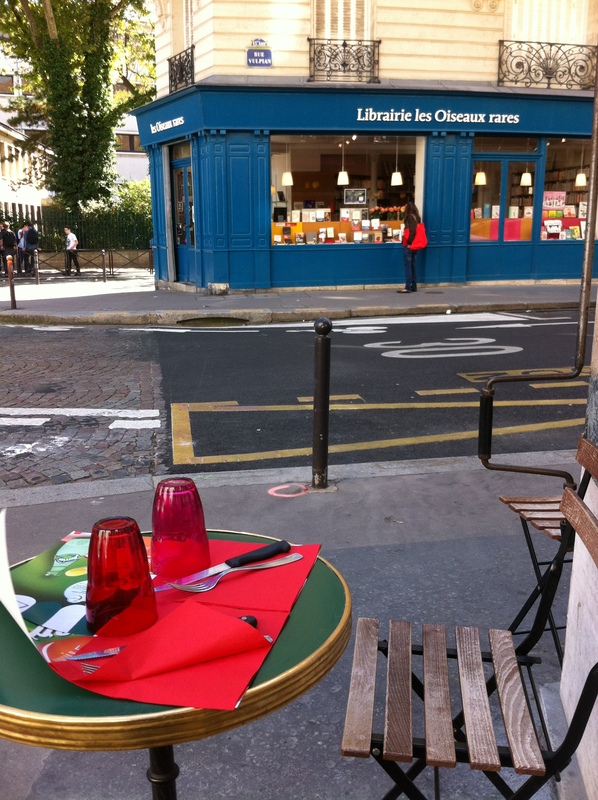 And yet, September, with ‘la rentrée’, is really about the complete opposite of the static, more the freneticness (as opposed to frenzy) of dense boulevards of traffic as Paris fills up again. You realise that in August you were actually living in a ghost town and hadn’t realised. 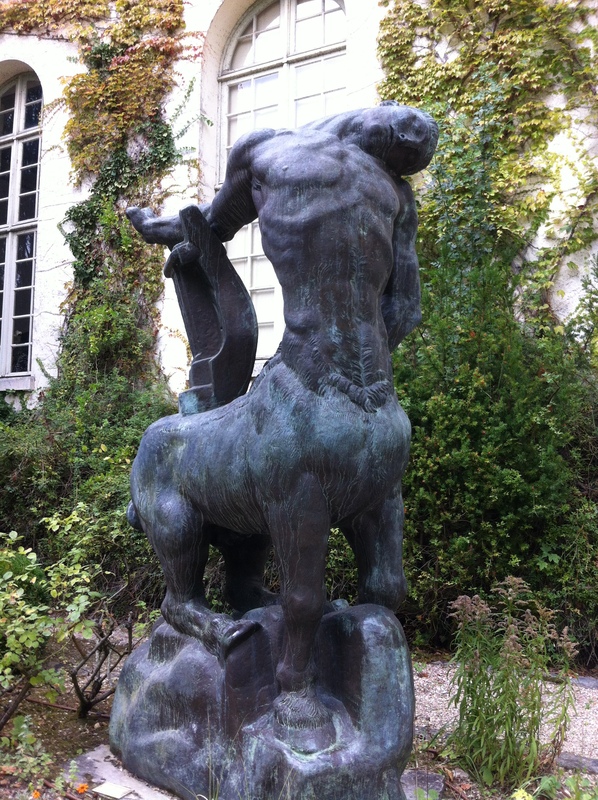 When I say statuary, I mean, firstly with visits to the Musée Rodin in hot early-September sunshine as family visited from England, and then one mid-week lunchtime, the charming studio and garden of the Musée Zadkine. Then came the discovery of Aimé-Jules Dalou’s (1832-1902) incredibly witty statue in the Luxembourg gardens that makes me smile each and every time I pass (I’ve made it part of my walk now between home and work just to stand and admire). More ‘still’ with the Open Days, and the discovery of Gustave Crauk’s (1827-1905) amazingly violent and aphrodisiacal statue in the Mairie of the 6th arrondissement. These are two incredible pieces of sculpture: one of an elderly drunk being propped up by four others as he falls off his donkey; the other of a man strangling a centaur who is attempting to steal his wife. And then a trip out of Paris to St. Germain-en-Laye, and yes, more statues in the beautiful gardens of the painter Maurice Denis (1870-1943). I think I definitely have a thing now for 19th century sculptors! It doesn’t end there. Last weekend I made a trip I have been meaning to make for 2 years, to Gelderland, a province in the east of the Netherlands, for the World Living Statues festival. Simply incredible. I was dithering whether to go or not and am so glad I went. 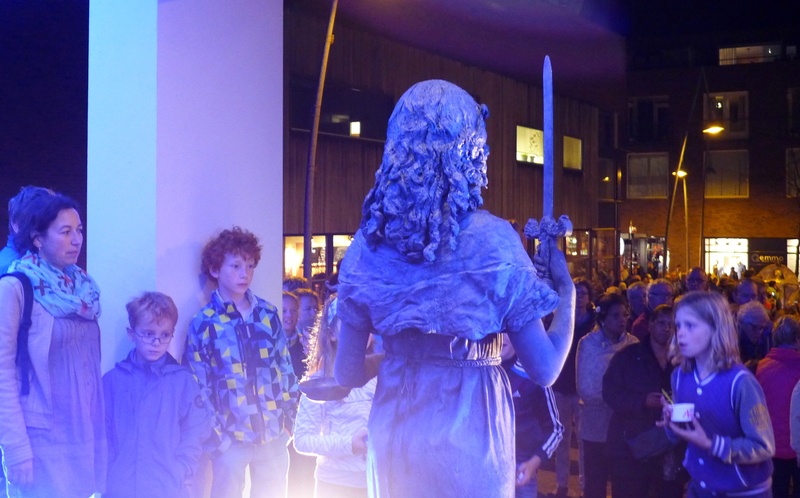 First, statues by night in the small town of Ede. I wrote to the organisers during the week and managed to meet up with three ‘real-life’ living statues: Afke, Minco and Elejan, all on their night off, before the big next day event, so carousing as tourists to check out the other living statues. It was fantastic to be able to interview them and ask them all about their craft. I soon realised that living statues is a community of friends and colleagues who are as passionate and serious about what they do as we are with poetry. There are prizes to be won, festivals to attend, and criticism to be dealt about other statues. 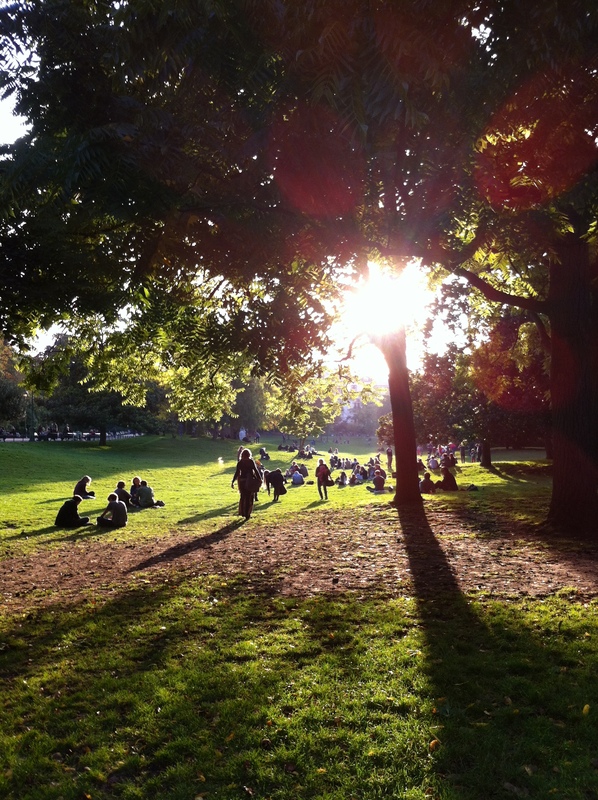 Next day was Arnhem – a really beautiful city with a lovely historic centre. 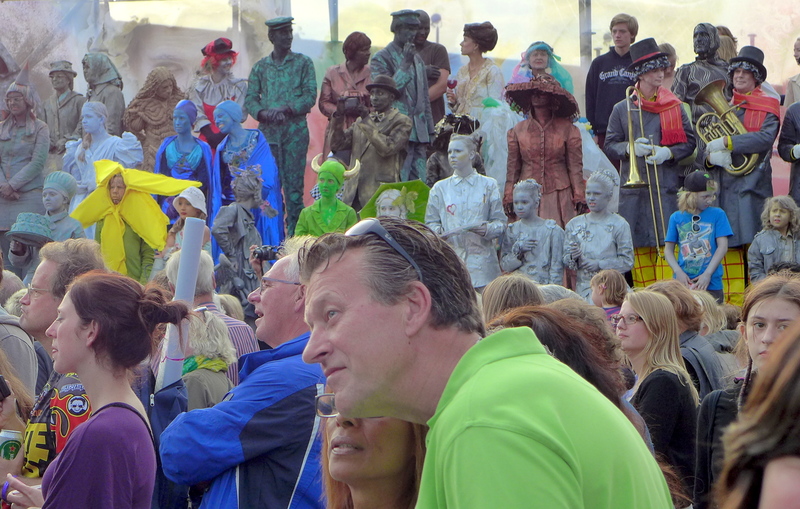 156 living statues in three categories: amateurs, professionals, kids. They literally ‘occupied’ the city. There was a one-way route and even in four hours, before the parade and judging ceremony at 6 o’clock, it was hard to see them all. I was taking notes furiously for future poems. 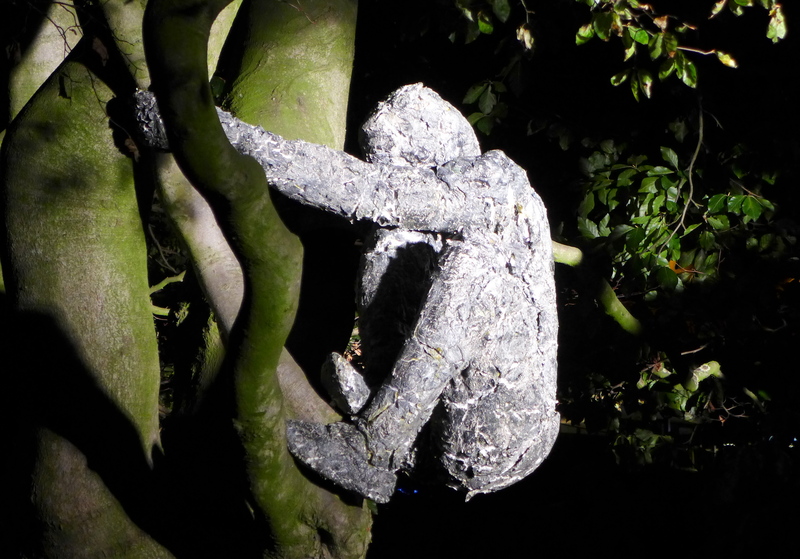 It was fascinating how some of the living sculptures did little for me, or did not inspire, whereas with others, I immediately felt drawn because there was a story, something unsettling, a tension with the crowd. The best sculptures are often the simplest, the ones that don’t cover their eyes, but keep the crowd guessing, watching. People had travelled from all over the world to take part in this international event, though a large proportion of statues were ‘home grown’. 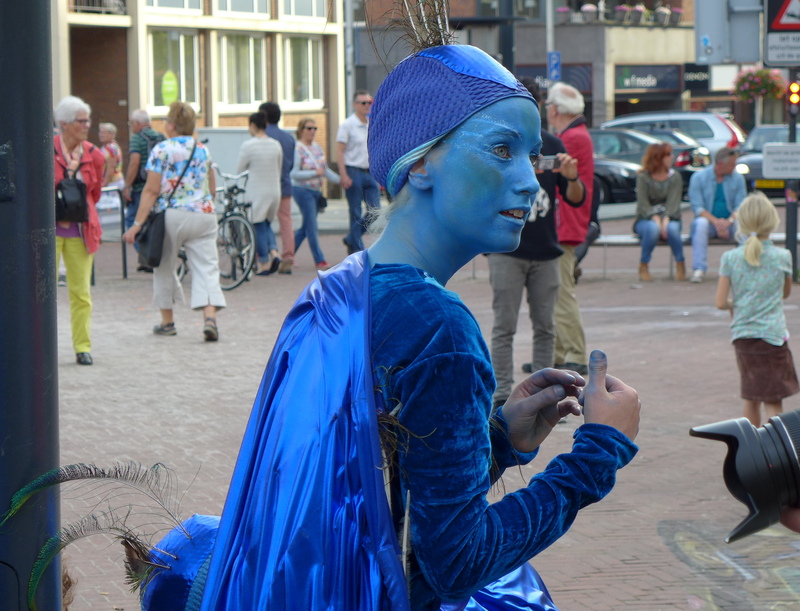 Which got me thinking whether this particularly art form is particularly Dutch – indeed there were ‘The Potato Peelers’ and a ‘Blue Delft Couple’. 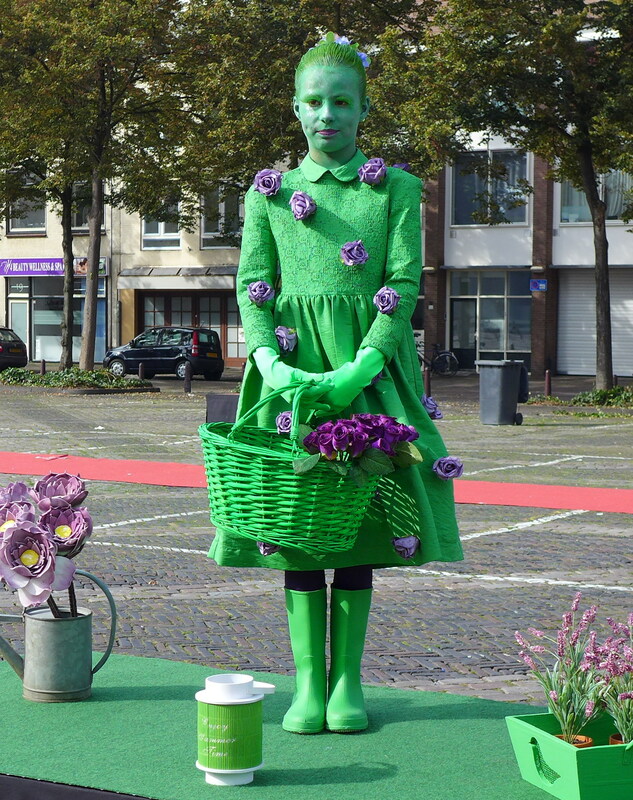 It seems to tie in with the national penchant for dressing up at carnival in February, during Lent, at least in the southern regions and across to Cologne. First prize in the professional category went to a group statue of five performers, called ‘The Amazement’, featuring Minco who I spoke to the night before. 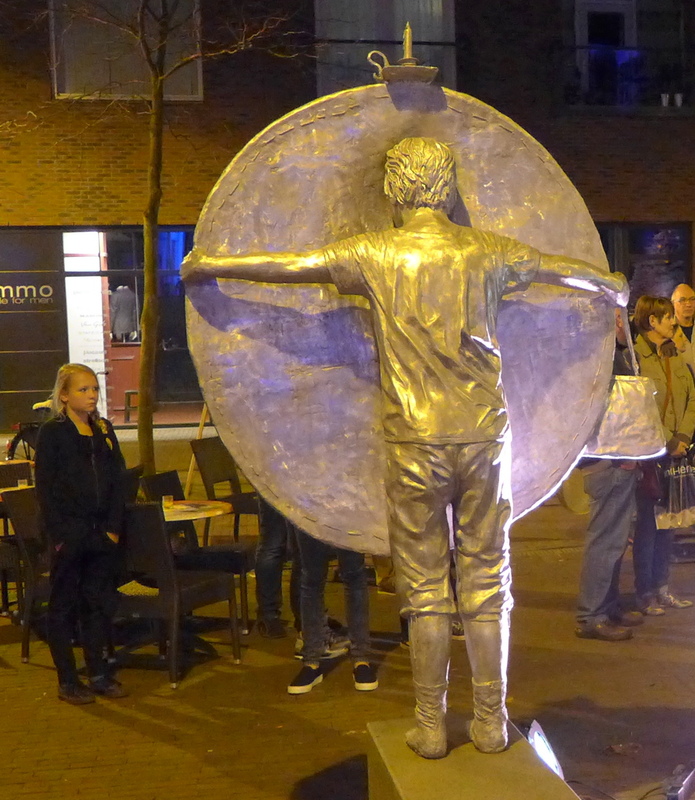 You could see their jubilation at being crowned World Living Statue and the mayor and all those gathered having a ball, particularly since the prize, voted for partially by the public, had gone to local artists from Arnhem. Other winners were from Belgium and Israel. Anyway, I was absolutely shattered at the end of it, and slept 12 hours next day, but came home with pages and pages of notes for new poems, and a want to try and go back next year. The Thalys was extortionate from Paris but worth every cent in terms of inspiration. I had no idea that there was a centre for Living Statues. I have always admired them, having been an artist’s model for several months at Camberwell School of Art, I became interested in the art of holding a pose. So I tend to enjoy coming across them in big cities. Lovely insights from your post, could have done with more photos, if you have them. Thanks Hilary – with this new template I should be able to get a lot more photos on the page. Have just added a few more in to my latest posts.